What's the cost to enter the show? Admission is $15 for ages 14 & older. Ages 6 to 13 is $10. Under 6 accompanied by an adult are free. Is the admission cost included in the booth? No, the admission fee is not included in the booth price. Do I need to pre-register for a booth? No, we will ALWAYS have booth spaces available including the day of the show! See Doug Benson at the OVKA Booth which will be located near the main entrance. What advantage is there for pre-registering for a booth? Reserving a booth ensures you get your previous booth location, end caps, electric, large runs of tables, etc. When can I setup for the Swap Meet? Setup will be available Friday, the day before, from 3pm to 8pm. As well as the morning of the show for one hour from 7:00 am to 8:00 am. When can I tear down my booth? The show is open until 3:00pm, which is when the tear down process of the booth can begin. When is the show open to the public? 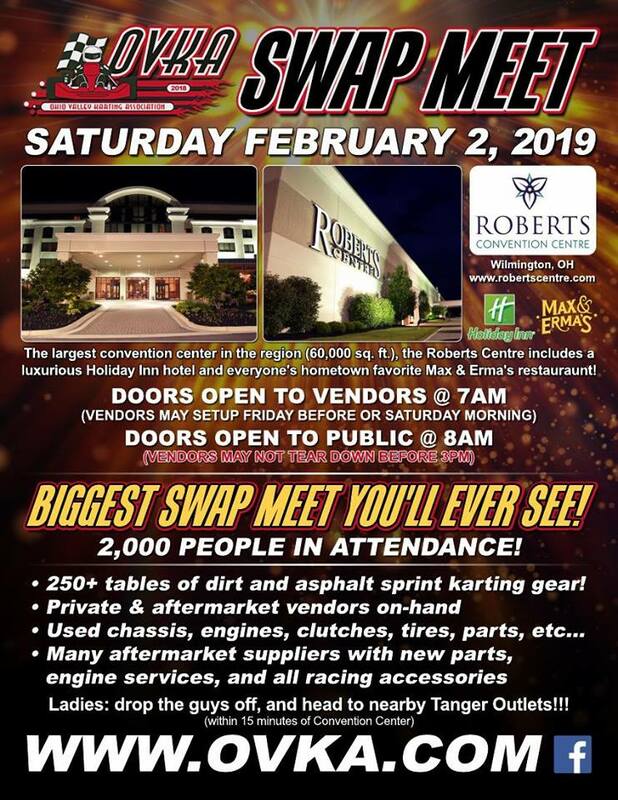 The show is open to the public on February 2nd, 2019 from 8:00am until 3:00pm. Is there any place to stay nearby? There is a Holiday Inn connected to the Roberts Centre; you can contact them at 800-654-7036. Ask for the OVKA Swap Meet rate of $119 per night plus taxes when booking. Is there any place to eat nearby? There is a very nice restaurant and bar inside the Holiday Inn as well a few restaurants nearby.